Orig. 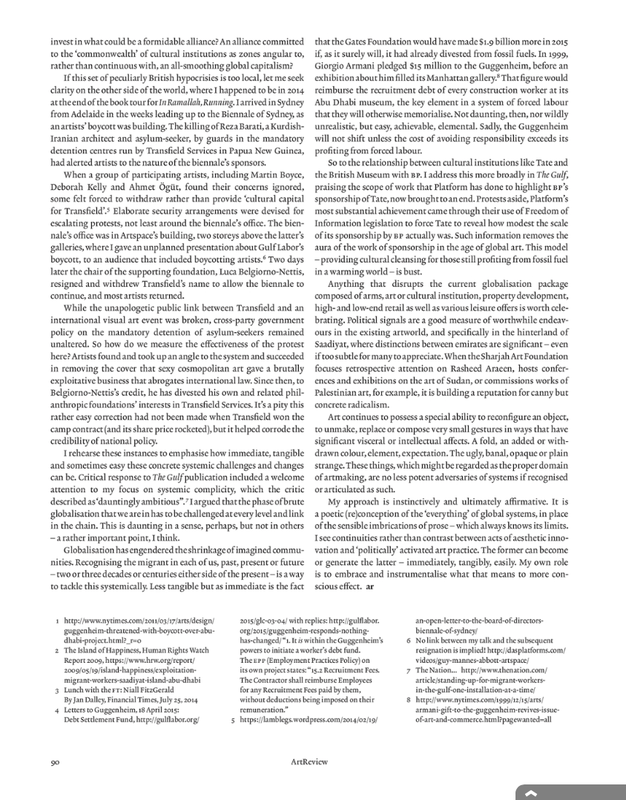 published 26 June 2014 by Ibraaz, an updated version is forthcoming in the Anthony Downey edited Future Imperfect: Contemporary Art Practices and Cultural Institutions in the Middle East from Sternberg Press. 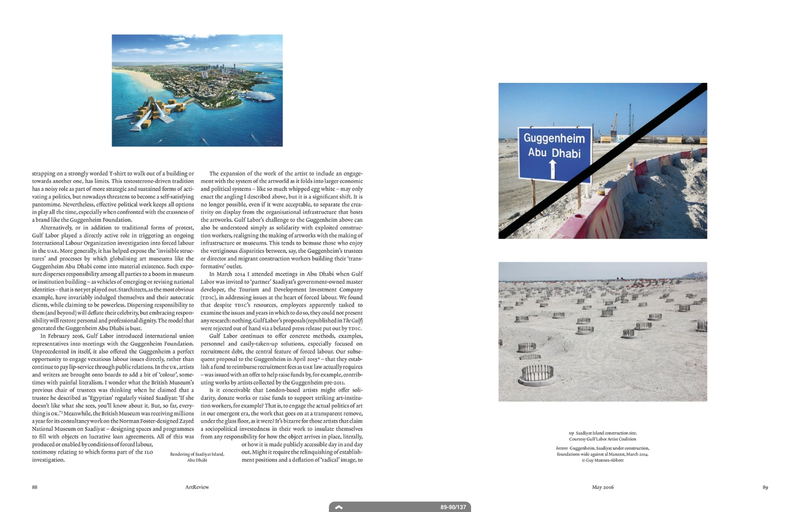 Look out for the special fold-out poster-wrap cover (designed by Zak Group) which is an image I took of the Louvre Abu Dhabi mid-construction, also in the (online) essay. A contents page for the book along with Downey’s introductory chapter can be found here.
. As Mud as Clear – WdW Review Vol.1 Arts, Culture, and Journalism in Revolt (Witte De With, Rotterdam) Forthcoming January 2107. ‘Better the Turks than the Pope!’ – Protestant Badge in the Shape of a Half-moon, 1574. A talk I gave at the conference held at Witte de With in February 2015, linked to a major exhibition: The Sultan’s World at BOZAR, Brussels. ‘As Mud as Clear’ was reworked to appear online first on WdWReview’s site and is now forthcoming in the collection WdW Review Vol.1 Arts, Culture, and Journalism in Revolt scheduled for January 2017. Available in all proper books stores and online here. 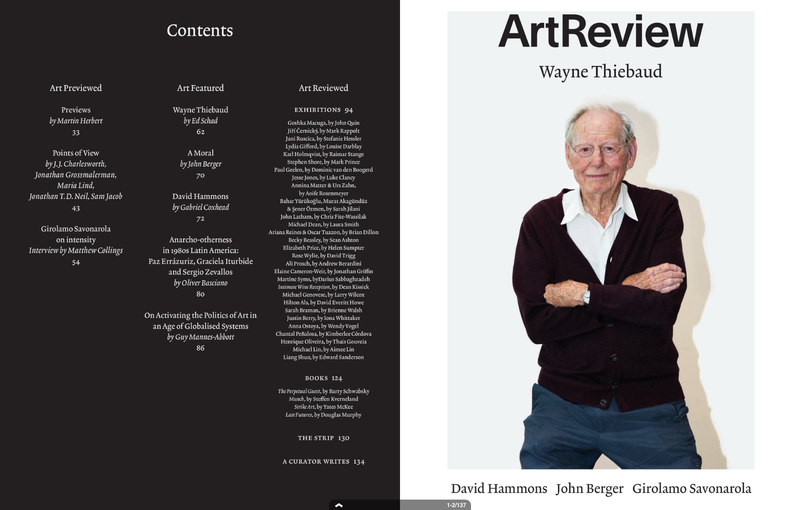 May 2016 Featuring: Wayne Thiebaud; David Hammons; John Berger; Guy Mannes-Abbott on art and labour; transgression in 1980’s Latin American photography; an interview with Savonarola; plus columns and reviews from around the world. NB: this was focused on the broad new argument it lays out and discusses but was in final edits just as the Guggenheim pulled out of extended ‘live’ negotiations in which GL had introduced NGOs and international unions to the Guggenheim and its board in New York, after 6 years of trying. The board and their director, Richard Armstrong, were thus enabled to resolve the exploitation of migrant labour at their Saadiyat site -with concrete measures from those already implementing solutions on the ground- but decided to abort and walk away instead. So, background references to GAD had to be built-on and foregrounded, perhaps making the crucial affirmative turn at the end of the text seem less likely. This text is an e.thing-like essay and response to Ala’s work which we intended as a ‘small collaboration’ too. My way-in to this very rich and complex subject is most directly through the work and person of the late indefinitely great Mohamed Makiya as well as the contemporaneous work that Corbusier was doing in India, at Chandigarh of course, but more significantly also in Ahmedabad, Gujarat -with which I have a real intimacy. Baghdad and this period of revolutionary change, is such a rich, under-explored or -articulated series of areas that I had to approach it in a very particular way, hence the series of seven texts -closer to the poetic than to narrative prose. Read on for a radical re-articulation of not just the London View Management Framework but how London is approached and how different that might be. Oberon is an elegantly produced periodical emerging from Copenhagen/Sydney, liberally and exactly illustrated, in this case with Bhupen’s work, my own images of Baroda and Ahmedabad, as well as the V&A’s images of modelled parts of MK’s remarkable masjid, carved minbar, jharockas etc. -including my images from 2002 and 2013 of pogrom damage and its hand-carved repair. Here is link to an excerpt from my Bhupen text, a unique account of witnessing the 2002 state-authorised massacres of Muslims in cities like Baroda and Ahmedabad and much of the rest of Gujarat too. Witnessing some of that with Bhupen in his car -or the Maruti he was using while his own car was being fixed. I gently urge you to order a copy from my friends at Oberon here. Issue 1 includes interviews with Charles Lim/Shabbir Hussain Mustafa and Nasan Tur. Issue 3 is imminent! Ahmedabad was founded on the east bank of the Sabarmati river in 1411 and became the first fully articulated Islamic city in India, bustling with continuous life ever since. Muhafiz Khan’s masjid dates for 1492, the peak moment in a century and a half of invention during which the city rivalled Delhi for wealth and cultural influence. (1) Ahmedabad’s finely-conceived old city inspired Emperor Akbar to his own heights at Fatehpur Sikri after conquering Gujarat in 1572-3(2), and is still largely present today in its fort and caravanserai, in its run of riverside bastions and walls, processional gateways, exquisite tombs and masjids. I wrote about Theaster Gates first White Cube show, which opened November 2012. I wasn’t aware of major changes underway at the same time -though was shown an ugly extended correspondence soon after- and my critical scepticism about the lazy spectacularity of this inaugural show, both from the perspective of a White Cube still engaged in reflex bigging-up which had ‘delivered’ for so long but which was inappropriate with this work, and Gates himself, whom I felt badly misread the stage and strategy in depressing ways. I wanted to try to confront these difficult things with exactitude in print, and have (almost) regretted it ever since! But, WC has undergone a major curatorial regrouping since then, and Gates’s second show there was of a different order, a properly serious exhibition of ongoing work. It’s not a matter of my having been proven right, though I do definitely think ‘we’ should be prepared to engage and critique each other from within as well as stay silent in dumb ‘solidarity’. I would prefer to have been wrong, to have overstated the case -and yes, I would tweak here and there… You are the judge/s! “Guy Mannes-Abbott: Could you describe the world you were born into? Mohamed Makiya: It was like the Middle Ages. I wouldn’t have to read about a medieval city because I lived it. There was no electricity, no water, no sanitation. I’m very much influenced by it. I’m deeply Baghdadi, and I’ve been thinking of Baghdad all my life. My father died when I was young, and as a child I worked for my uncle, who had a shop in the souk. Every day, I opened the shop for him. When I got out of school, I did my lessons in the shop. I had to hide my books under the counter so my uncle wouldn’t see me — he wanted me to pay attention to the customers. We lived in a prominent Shia neighborhood called Suq Al Ghazl, very central, and close to something called the Weaver’s Mosque that went back to the Abbasid period and Baghdad’s founding. Our family was a prominent weaving family. My father would get the materials from the Silk Route and from China. He was one of the main dealers, and my cousin had one of the best shops in Baghdad for textiles. Later he started bringing them from Italy, but before that we brought everything from Aleppo, Syria, because the industry there was very good. Modernity first came to Iraq from Damascus, Syria, and the Mediterranean. GMA: So if, as you say, you are Baghdad, if this upbringing is in all you do, how did the actual house in which you grew up influence you and your work? I was fortunate enough to spend quite a few hours with Mohamed Makiya, over a number of visits and exchanges. There is a lot in this interview, itself a condensation of tens of thousands of words, but so much more to discover and write! There are good but partial books (in English) about him but I hope an independently authoritative account of his life and work will emerge in time (a biography has been commissioned). He and I did get beneath the skin and some way further but I wish he were still with us and that I could keep ‘exploring’ with him and, of course, his buildings across the region -an absolute necessity. His exact age was not recorded but his mother said he was born ‘when the British came’, itself disputable, but he was about a 100 when he died in 2015. “I’ve heard Mourid read his poetry many times since it began to appear in English. He reads without introduction or quip and the work is received in stunned silence. Audiences realise they’re hearing work of lasting rarity on first encounter. Work that wrestles with the particular and universal in unique ways. The poems have an openness which encloses great depths, their lines draw landscapes in your palm, catch the skin with universal truths. Boyd Tonkin wrote a startlingly good review of Midnight in The Independent. For extensive, read hundreds of thousands of words, part of millions altogether, thousands of images, hundreds of people, hundreds of days, tens of thousands of kilometres, and crucial re-circlings that turn these numbers into much more difficult-to-acquire qualitative understanding, experience, time-limited authority (then, not so much now, although the time of Gujarat does not stand or fall on single decades) deployed in a manuscript that got thwarted and which I will return to during 2018. We began working with Penguin India to publish it there first which made me very happy because that sweated-out manuscript was written from somewhere between there and here, London. Closer to ‘there’, in fact. Also because India, at a deeply engaged level; under-the-skin if not of the flesh (can I write that? ), is barely part of British consciousness or even curiosity. The willed mystification and associated disinterest has long been bewildering to me (outside new-academic interests, like this wonderful-looking book; Jinnealogy (Stanford UP) about the reviving from ground-up of Firoz Shah kotla in Old Delhi, which made me so happy to stumble upon some years back. Nothing to do with Gujarat, except that everything is; Firoz Shah and army were almost deliberately stranded in the Rann of Kachhch by local trackers, on his return from Sindh in the 14th century). However, the world goes on changing and Gujarat and my authoritative manuscript about it and its astonishing stories and people doesn’t need that kind of curiosity so much any more and Britain can afford the lack of it even less. ‘We’ are heading back into an age of begging for coastal Factories or equivalent in reverse, certainly if Brexit take place. The manuscript, which I will want to revise/revive having only been in Gujarat once in recent years were I saw superficial and substantive changes, is unique when it comes to this most interesting state -so often in the vanguard of subcontinental life. It also rehearses the way that these greatly influential centres rise and fall and rise again. My manuscript was badly hit by Penguin India’s actual lack of independence when budgets and lists were severely cut from afar. Then it fell into an agent-shaped hole, with a new agent who preferred to break the contract they had just had me sign, rather than countenance my writing anything in relation to ‘Ramallah’. I’ll save quotes about A Gram for the eventual book cover/bumpf, but it captures valuable, grubbed-up primary research, has some highly affective chapters (including the one built for these kinds of fragments) that interweave personal, public and historic elements, as well as engaging many large, universal, eternal things -things which a world in melt is having to figure out again- with urgent clarity. I have a lot else to do right now, some of which -in the Gulf- stirs directly related Arabian Sea/Indian Ocean pots, but will recover this during this year, and keep you posted! Link to the published text and some reflective notes in Tank here. “… This enables us to conceive of new, mobile, dirty Utopian enclosures whereby limits are drawn and theorized within in ways that are physically traceless (but no less potently actual for that). This is a Utopianism written in time (time in space rather than space in time). It is a Utopianism, therefore, of dynamic form – as opposed to prescriptive schema. A Utopianism that is broken-down, miniaturized, cobbled together, as light and mobile as digital space, an insistent and necessary hope against hope. It is a dirty Utopianism that can take something elemental (like time) and transform it. In Wong Kar-Wai’s film Days of Being Wild the lead character eventually persuades a woman who is resolutely refusing his advances to spend a random minute with him in silence. After huddling together watching the seconds pass, he declares that from 16 April 1960 ‘we’ve been friends for one minute. This is a fact you can’t deny. It’s happened’ – he will always remember it. This act of memorializing forms the film’s narrative dynamic and it does prove unforgettable in peculiar ways. But it is also an act that exceeds its context; the political instability in Hong Kong at this time, and the totally dissolute, incoherent, listlessly ‘in-between’ lives that characterize the film and the period in which it was made – the 1990s (so brilliantly staged in Kar-Wai’s classic pair, Chungking Express and Fallen Angels).